Portland Bolt is a leading manufacturer of construction fasteners for covered bridge maintenance and restoration projects. In April, 2014, Portland Bolt was called upon to supply fasteners for the restoration of the Larwood Covered Bridge. 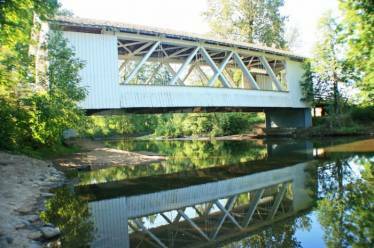 This covered bridge is one of two historic covered bridges in Linn County, Oregon. The Larwood Covered Bridge was built in 1939 and spans 105 feet in length. In 2002, the bridge was temporarily closed due to repair for water and insect damage which had weakened the wood. Crabtree Creek, which runs underneath the Larwood Covered Bridge, is the only creek that a river flows into, which was featured in Ripley’s Believe It or Not. 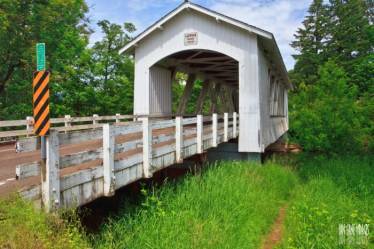 The Larwood Bridge is named for Williams Larwood who settled on the banks of Crabtree Creek and Roaring River in 1888. 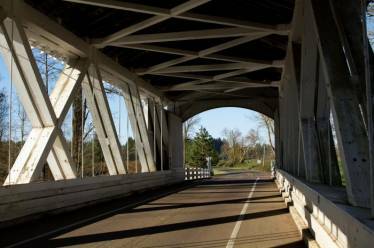 The restoration project was granted almost $500,000 for repairs on the bridge. Because this project was granted federal funds for the restoration, all of the products had to be 100% melted and manufactured in the USA. Portland Bolt manufactures all products in-house using domestic round bar that is produced by local steel mills. Full certification documents are provided with every order, free of charge, to ensure that the bolts and hardware meet specifications and domestic requirements. Because of our ability to produce domestic product quickly and correctly, Portland Bolt was a no-brainer for this covered bridge project. There were over 1,000 headed bolts on this job which was no problem for Portland Bolt since our 85,000 square foot manufacturing facility has the ability to handle an extremely large amount of volume at any given time. All of the bolts were hot-dip galvanized, which we were able to perform quickly thanks to our in-house galvanizing line. Our galvanizing line is specifically designed for threaded fasteners and there is never any issue with nuts fitting onto the threads. The entire order shipped out just 3 weeks after receiving the purchase order. The product was delivered on time which was critical for the contractor’s job schedule. Do you have a project that requires 100% domestic product and you need it fast? Give Portland Bolt a call! Our estimators are waiting to help you on your next project!